Should they press? Should they restrict our opponents? How do we make them calm on the ball but also make a killer pass every two touches? As utilitarians for the rest of the team, midfielders need to keep up with play, provide cunning passing options and cover spaces that other players leave. 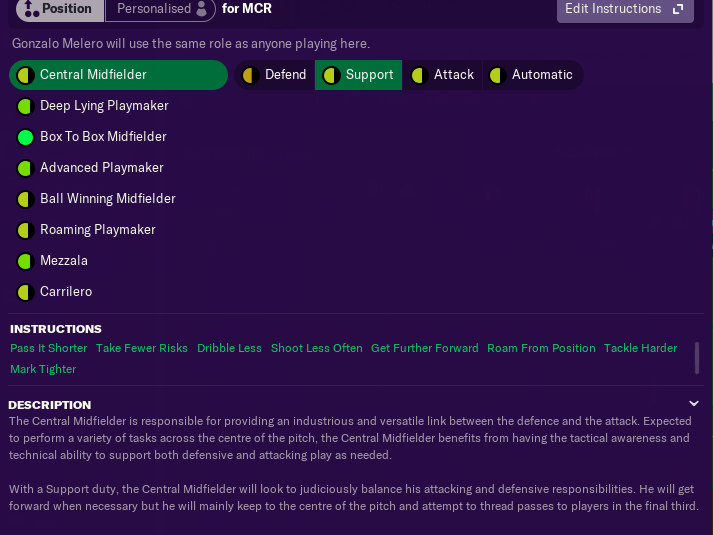 With midfielders needing to do so much, how do you pin them all down into roles and positions to meet FM19’s parameters? Let’s discuss the formation as a starting point. The right judicious balancing of responsibilities can make most formations work, but they all impose different requirements on midfielders. Strikers need creative support and defenders need protection. Midfielders need both. There’s a misconception with top-heavy formations that midfielders need to only focus on the defensive work to make the tactic balance. For instance, with a 4-2-3-1 wide, the two central midfielders can make or break the formation. This includes finding the attackers in the best positions to catch the opposition out. The attackers need to receive the ball in the best positions! How does this differ from more defensive formations? Space. With a 4-2-3-1 Wide, once the attackers have received the ball in advanced areas, they can probably create enough goalscoring chances themselves. That’s assuming you’ve set them up correctly! However, to make use of the pitch’s size, the CM’s must still pose a threat when the attackers pass back to them. Ideally, your restrained central midfielders should be like metronomes. Get possession from one side of the pitch to other, to create space and catch the opposition out as quickly as possible. If the central midfielders are in deeper positions, they will also help to block out the opposition’s counter-attacking threat. Midfielders should complement what the attackers and defenders want to do, not neutralise their roles by something totally different. By the same token, with a defensive formation like 4-1-4-1, it would be useless to pick a midfield of playmakers with only target man up front to aim for. With each role in your setup, think about the space your midfielders are expecting to create. FM19 is pre-set for certain things to happen. If you play with wingers, they’ll run down the line and cross even if there’s no one in the box. If you pick a target, he will receive hopeful balls into the channels, even if you’re set up to play a patient possession game. Playmakers do not provide an all-encompassing, fluid creative role. Rather, they predominantly dedicate their entire games to finding pockets of open space. Advanced playmakers work best when there’s enough space in the number 10 hole. Deep-lying playmakers work best when you can predict the movement ahead of them; they’re never expected to join in attacks. Roaming playmakers work best as the heartbeat of your team. Like the other playmakers, they predominantly play killer passes, but they also roam up and down the field. You can never rely on them for positional discipline. FM19 isn’t not as fluid and dynamic as you’re expecting; this is my last warning. Don’t only focus on creating space for the attackers. When I played with wide midfielders, I liked to play them as wide playmakers. This sucked opposition full-backs inside and created space for my wing-backs. When they were wide attacking midfielders, I often picked advanced playmakers or inside forwards for similar reasons. It’s important to note that inside forwards have wider starting positions than advanced playmakers, though. This can stretch opposition backlines, in the hope that they’ll eventually become unstuck! This is my tactic right now. It’s doing decently, with newly promoted West Bromwich Albion sitting cosily in 10th place; we’re in 29th September 2019. On one look at this tactic, one consequence is glaringly obvious: my midfield is hopelessly outnumbered! That could be a problem, but I don’t rely on my two central midfielders for the legwork. A lot of that comes from my deep-lying forwards. If a team’s passing options are blocked, they have no choice but to go backwards. Once it reaches their goalkeeper, the opposition will usually kick it forward and your whole team cans move further up the pitch. The key to building a good midfield in FM19 is getting the attacking setup correct. Deep-lying forwards and advanced forwards both provide different ways of traditionally linking the midfield to the attack. 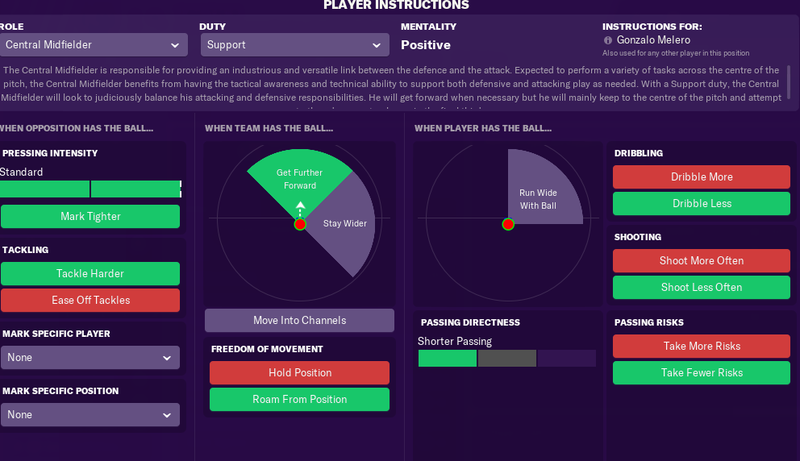 In FM19, when the ball comes back in play, a player’s starting position will be heavily influenced by their role; they revert to their position after a few seconds. Due to their deeper starting positions, more creative roles like false nines and trequartista’s aren’t as effective pressers. Even using a pressing forward doesn’t always make the difference. Just ensure that your attacking line starts their pressing with the line of engagement you set. Having pressing settings at their maximum helps! In addition, pay close attention to the ‘player movement’ tab. I used to have ‘play wider’ selected, believing that just affected the players in possession. But, no; to my horror, the deep-lying forwards just stayed upfield in wide positions. They were only set to press when the opposition full-backs received the ball in deep positions. Although it’s a fixed setting for deep-lying forwards, ‘move into channels’ is also counter-productive; if the players see space to break into, they’re more likely to stay forward. However, when you’re playing with three forwards, that can be mitigated with pressing settings. See the shift in positioning from my left-sided forward, Jonathan Burkhart. When playing with three suitable forwards, they can help restrict opponents as well as pressing them. Especially if you want to press the entire backline as a starting point. And this was displayed against a side with an annual wage bill of £80.55M, compared to our £30.09M. The forwards’ work should give the midfielders the freedom to pull the strings. With the opposition not able to play out of the back, the defenders and midfielders should have more freedom to roam forward. The midfielders should then be more useful for cut-backs and late runs into the box. That clip was troubling; it showed how easily space could open up for the opposition. On the other hand, it was promising that right-back Federicks did not have many options running forward in support. That’s why he was eventually tackled. Everyone on my team had tight marking duties; midfielders Melero and Boadu were preventing their opponents from making inroads. Centre-back Baumgartl could be relied on to set up and make that tackle; he was a spare man deployed in a three. When there isn’t a spare man, the players are more likely to retreat space and focus on restricting their opponents. Of course, that might not happen all the time. Any player can lose their man. Ideally, your system should allow for everybody to be closer to the forefront. Again, it’s probably worth reviewing the ‘player movement’ screen. We need to get the team in the right positions to engage the opposition effectively. Taking ‘stay wider’ off was effective, and the midfielders follow their opponents further back as they don’t ‘move into channels’. That said, some of these instructions might prevent them being singularly devoted to pressing off the ball. ‘Get further forward’ and ‘roam from position’ might catch them out at times. Giving the freedom to do whatever they want, without much of a reference. That would be brave, and frightening from a manager’s perspective. Defining their role yourself to build a stronger collective unit. This can be at the expense of some of the player’s individuality. Whichever role you pick, make any tweak necessary to ensure that every player satisfies the team mandate. After doing that, when something goes wrong, you’ll have a better idea how to fix it. You’ll know exactly what the team, and all of its players, are meant to do and why they are meant to do it. On the ball, you need to penetrate. Talking about shape all day might work if you’re only aim is to scrap every match and nick the odd fortuitous win. For sustained success, you need more. Everyone has their own combinations to best deploy this task. Both human players and AI’s commonly put a more aggressive midfielder need to a more restrained one. These combinations could be DLP-AP, BWM-BBM, or anything of that sort. You probably already know that a plethora of ideas can work. The end result must be a midfield able to create width, have runners from deep and be able to play at a high tempo. The key is defining how your team want to pass and move. Playmakers and creative roles need runners ahead. Players who have lots of fixed movements like mezzala’s, roaming playmakers and inverted wing-backs need protection. 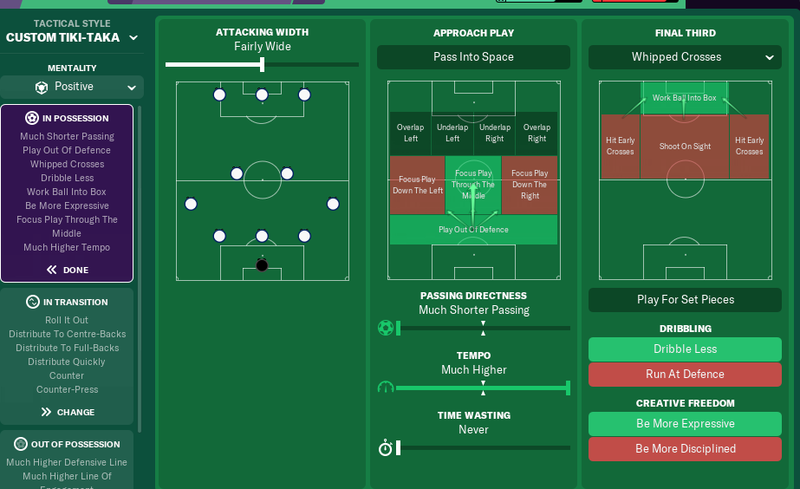 To balance all of this together, I try to set tactics out where the team’s needs are met, but the player’s tendencies are restricted the least. The central midfielders in my tactic mainly circulate the ball to the overlapping wing-backs and pass forward to the deep-lying forwards. There isn’t anything that their role doesn’t allow them to do that’s needed, so why restrict them? That won’t always apply with your tactic, particularly if the central midfielders have more midfielders around them. This is an underrated way to get midfielders involved in FM19. If you get lots of players forward, they don’t stay in the box even if you instruct them to. They will stay around the box, get into space and often make late runs. It’s a fantastic way to pin opposition teams back; this match engine exploit means the move starts through a simple throw to a teammate! In real life, Stoke under Tony Pulis constantly prioritised throw ins as a means to score goals. Albeit in a different way, under different circumstances. However, scoring five times as many goals from throw-ins as the average team in 2010-11, according to The Numbers Game, played a large part in Stoke’s continual survival. Remember, they only scored half their goals from open play; an average of 0.51 compared to the Premier League average of 0.85! Hopefully, for a topic this broad, there are some useful pointers here. I hope this article has shown you my thought processes in practice above all else. Thanks for reading, and feel free to comment or this blog if you have any further questions or thoughts on the topic! Alternatively, our social media channels below are open, along with mine at @BenDewison. How do you go about building your midfield? What if Foles Played the Other Football?